When you think of the police, aren't you more likely to picture the guy who just gave you a parking ticket than the one who watches over your neighborhood? Why? Because they have an image problem! How do you fix this? With better communications. Like, for instance, this new years best wishes video message, or with this huge plastic canvas hanging on the front of La Préfecture de Police (the main Paris police building) on the Ile de la Cité. It shows all the faces of police(wo)men, from the one that dives into the Seine to rescue people who fell into it, to the one who clears mines, without forgetting the civil servant that issues your passport. Great shot! But I've dealt with the prefecture and this is definitely NOT how I picture them! Okay, I admit it—this is pretty good PR. And I do like the mural of all the giant flics. Will it be up there for very long? I also took the same photo when I was in Paris last week! (was it really only last week?). I had to take it in two halves, me being a mere amateur! but goodness, I thought it very impressive. It kind of smacks you in the eye. I remember seeing the police in riot gear on my last trip to Paris. I asked one of them if I could take his picture and he was not too happy with me. Fun photo, Eric. These people are good looking. Are all Paris police attractive? Hee! I wondered the same thing, Petrea. Like I always tell my kid, if you didn't do anything wrong, you have no reason to fear the police. My question is - where do they print these giant photos? Oh la la, I'll take the skater. They might need to don riot gear to hangle the PDP ladies! This is a great idea. An ex boyfriend of mine was the English equivalent of the second on the left! Ours wear black though. They all look really handsome don't they. The roller blading ones fascinate me. I just can't imagine that happening in the UK. I love the way you've got the real people in the shot below. They look like little toys. Ok Sue lol no probs! Makes for a very unique mural, at least. You have policemen on roller blades? Cool! This has nothing to do with anything, except that the men in the gendarmie in Paris were on par with NYC firemen! Wow! What a good looking bunch of guys! Sue, how did you meet up with the Paris riot police? Just curious, of course. Oh Eric, I fear you may have hit a winner here. Between the PDP fans swooning, those of us who have dealt with the Prefecture booing, this certainly is a good conversation starter. I like how you didn't just shoot the mural, but the people and cars too. It really gives a perspective to the size of the police. I meant the size of the mural of police! Do you know that besides "flic", that they call the police "poulet" (chicken) here as well? I've been told it's because the original Paris police station was built on the site of an old chicken farm. Can anybody confirm that? Oh yeah...gotta love those Paris gendarmes on the roller blades. We watch "Police Judiciaire" on TV5 Monde...and the story lines are so different from American Cop Shows..much more like a detective series. Dealing with the Prefecture de Police...Pffttt..not so much fun, but I don't think it is fun to deal with the Police anywhere is it??? "Pourquoi appelle-t-on les agents de police 'poulets' ? en 1871, Jules Ferry met à disposition de la prefecture de police la caserne de la Cité pour en faire son siège. Cete caserne ayant été bâtie sur l'emplacement de l'ancien marché aux volailles de Paris, le sobriquet de ''poulets'' est alors donné aux policiers." I'm with phx! But what do the roller-blading police do? Issue parking tickets? Chase bank robbers? Run down dog owners who don't pick up their Médor deposits? Thanks for that Tomate! That puts some facts behind the tale and now I'll feel comfortable calling them "poulet" without offending them. Ok, maybe not. So where does the slang word "Pig" for cops in the U.S.come from? They are sometimes called Pigs in the UK too. No idea where it came from but it's really derogatory. 'Old Bill' is another one, slightly less insulting. 'Cops' is imported from the US of course but is used sometimes. 'Bobbie' - not so often used now in the UK but is a very old nickname. So named after Sir Robert Peel who founded the first English policemen. 3/ the 2nd counted by the left is a member of civil safety bomb squad, who are not policemen. Civil safety as paris firefighters are military, but under control of the state representant in the department who is for Paris and the 3 departments of the "small crown", the Paris police prefect. Oh that's interesting. I did wonder. I thought the 2nd from left was the nearest to a specialist firearms officer that I could see there. I agree with Michael. The cars and people give this perspective. 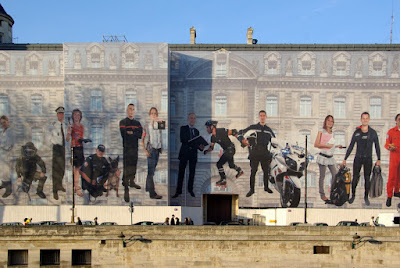 Leave it to the French to do it in a smashing way instead of a dinky billboard! Lynn -- I thought we got the term "cop" from you guys. Or was it the American police who had copper buttons on their uniform? You know what, Eric? Everytime I drive along this "canvas" since a few months (which is at least once a week), I think to myself: "this is a photo for Eric and PDP"..
You know, on PBS they show "European Mystery" on Monday nights and sometimes they show old Maigret movies with Bruno Cremer. I just looked on wikipedia, and it looks like the series with Bruno Cremer was shot in the 90's but when you look at them, it feels like you're going more than 50 or 60 years back in time. Oh I don't know Alexa? I always thought it very American to say 'cop'. I stayed near this building during my trip in Feb 2009 and always wondered why there's so many police officials hanging around the area. The ironic part was, on our way back to the airport, our driver was fined for talking on the phone by 2 female police officers. It's definitely NOT a friendly image I saw. He was just making a turn at the traffic! After what seems like hours of argument (and we fear missing our flight! ), the driver came back to the car and said "Paris is good for tourist, but for me, it's BORING! Too many fines!". I loved seeing this when I lived in Paris Last year. I always got a kick out of the 'blading' officer. Always fun to look at it. The Dior ad right now accross the seine is terrrrribly boring.